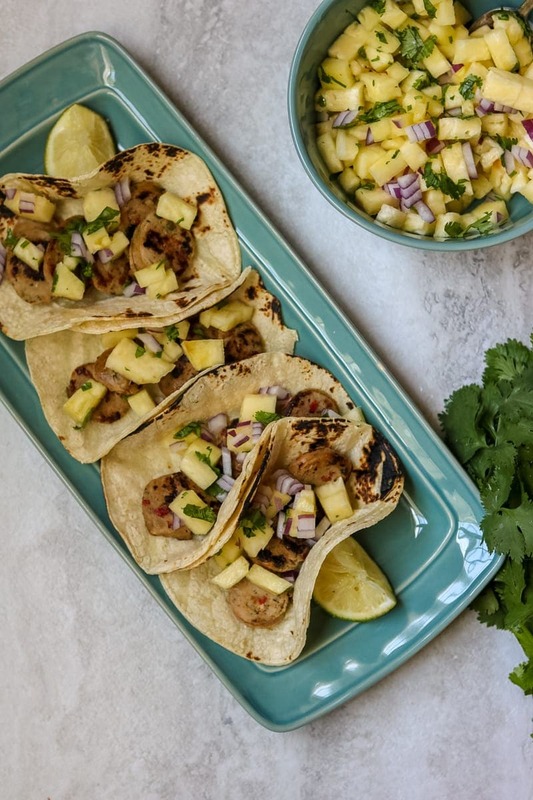 Jalapeno Chicken Tacos with Pineapple Salsa: Spicy chicken sausage is quickly charred and then topped with a simple fresh pineapple salsa for a fresh and fast spin on a taco. Tacos are pretty much the best food ever–am I right, or am I right? The fillings are endless and then when you throw in the toppings–you are left with limitless combinations. From Buffalo Chicken Tacos, to Black Bean Tacos, Asian Fish Tacos, to Instant Pot Pork Tacos, there is a taco for any occasion. Seriously it is mind-boggling to think of all the endless ways to create tacos. With the help of some al fresco all natural Chicken sausage, one of my new favorite tacos is Jalapeno Chicken Tacos with Pineapple Salsa. Spicy Chicken Tacos come together in less than 20 minutes!! Yes, you can make these jalapeno chicken tacos complete with a fresh pineapple salsa in under 30 minutes. Making them a perfect addition to my collection of 30 Minute Meals! And of course most importantly–the flavor y’all!! These Tex-Mex Chicken Tacos are spicy from the jalapeno, sweet from the pineapple, fresh from the cilantro, and bright from the fresh lime juice. Mmmmmm, these pineapple chicken tacos are SO good! You have three choices when it comes to the meat in these chicken tacos. I adore the ease of the chicken sausage, but if I happen to have leftover rotisserie or shredded chicken, these tacos are just as easy to make. 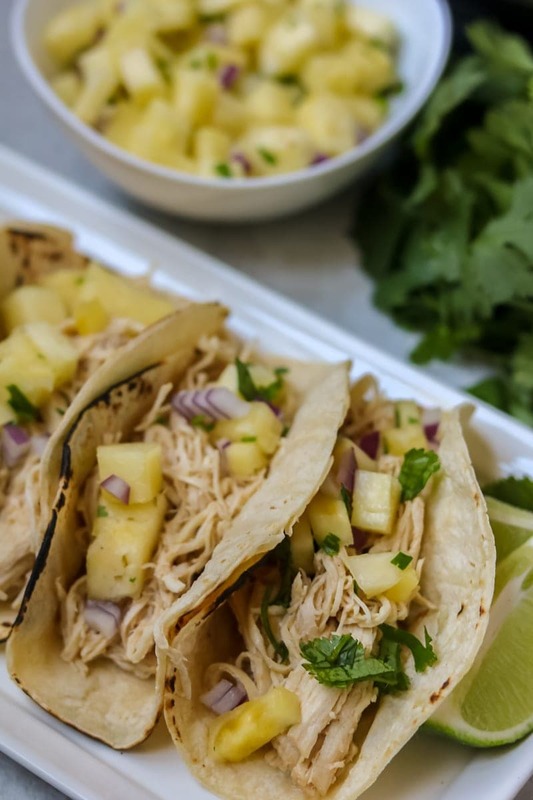 Regardless of which meat you choose, the pineapple salsa is what makes these Chicken tacos spectacular. Tex Mex Chicken tacos are easy and tasty served plain, but when you add pineapple salsa to chicken, magic happens. From perfectly cooked Instant Pot Chicken Breasts, to Jerk Chicken Kabobs, pineapple and chicken are truly a match made in heaven. Fresh pineapple is tossed with a bit of jalapeno, red onion, cilantro and lime juice for a bright and fresh salsa that brightens up any dish. These Spicy Chicken Tacos are the perfect football food. The perfect party food. The perfect weeknight meal. The perfect BBQ food. Really the perfect anytime food–because it is a taco. And everybody loves a good taco. An easy taco made with jalapeno chicken sausage and a fresh pineapple salsa. Toss pineapple, red onion, cilantro, salt, and zest and juice of 1 lime in a bowl and set aside. Heat non-stick skillet or grill pan over medium-high heat. Slice the chicken sausage into 1 inch slices on the bias. Sear the sausage for 2-3 minutes per side. Warm the tortillas and serve the tacos, by layering each tortilla with sausage and pineapple salsa. I’m not sure why I haven’t thought about putting sausage in a taco before but it makes total sense! I’ll have to try these, it’s only 8:30 in the morning and now I want tacos! I could really go for these right now! I always could go for these! Spicy + sweet flavor combo is surely a hit on game day! They are a hit whenever you serve them!